Your Donation Really Does Save A Rabbit's Life. 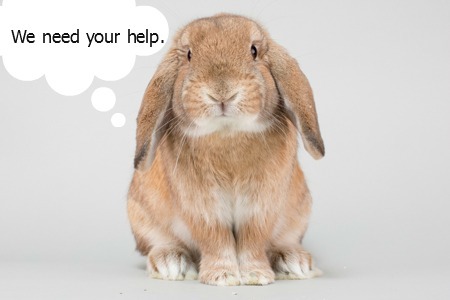 You don't have to adopt a rabbit to help. You don't even have to live nearby. All you have to do is care. You can become a monthly core supporter. Or, a one-time sponsor. Remember to ask your company about matching contributions. SaveABunny is an approved 501c3 nonprofit organization and donations are tax deductible to the full extent provided by law. Donations also make a thoughtful, lasting gift. Make An Safe Online Donation! Monthly donations are critical to SaveABunny because they help us to deal with ongoing rescue expenses (ongoing medical issues, spay/neuter expenses, food and electricity bills, etc) without anxiety. Bunny Nibbles Donation of $10.00 helps to buy green veggies one week for a rabbit. Yummy! 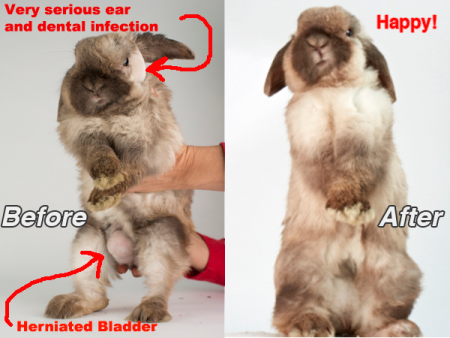 Bunny Tender Care Donation $50-$75 pays for a veterinary exam for a rescued rabbit. Providing the highest quality of medical attention to injured, abused or neglected rabbits is a primary focus. Bunny Kisses Donation of $100+ pays for the spay or neuter of a rescued rabbit, or pays for one day of shelter cleaning help. Bunny Pure Delight Donation of $250 pays for the rescue, spay or neuter and food for 6 months for a deserving rabbit. Additionally, at this level you qualify for the "My Mutt" pet photo portrait at PetFood Express. Please click on this link for more information! Bunny Bliss Donation of $500 pays for the rescue, spay/neuter and year long care for a rescued rabbit, or the surgery needed for a special needs rabbit like Oliver who would otherwise be euthanized at a local shelter. You will also be the angel that saves a rabbit's life. Oliver, before and after extensive surgery and special needs care. SaveABunny is an approved 501c3 nonprofit organization and donations are tax deductible to the full extent provided by law. ON BEHALF OF THE ANIMALS...THANK YOU!